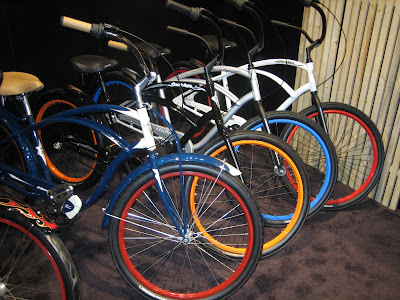 Century Cycles Blog: Seth Rogan rides a cruiser. Should you? 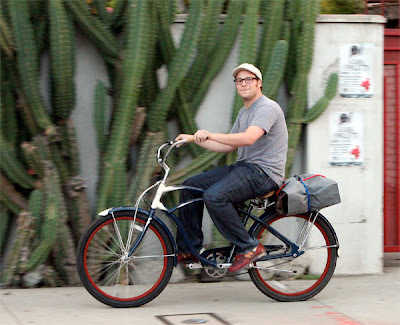 Actor Seth Rogan cruises the streets of California on an Electra Super Deluxe (key features: lightweight aluminum frame with Shimano Nexus Internal 3-Speed and coaster brakes). We don't currently have this bike in stock, but you can test ride other men's cruisers at Century Cycles, and we'd be happy to special-order the Super Deluxe for you. This picture reminded me of how hot cruisers were at Interbike, the bicycle industry trade show in Las Vegas back in September. Think cruisers are just for "girls?" Think again. It's a hot bike style for everyone. Why the trend? The big picture answer is "bikes as transportation." 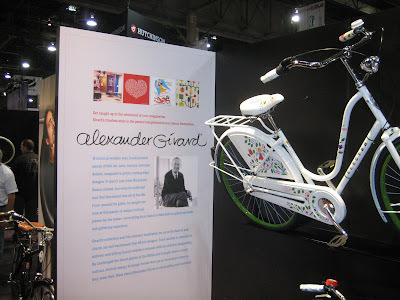 Many of these bikes are inspired by the European way of life, of traveling by bike even in a suit and tie, down to the design of the bikes themselves. In fact, Electra so openly acknowledges the lineage that they have an entire line named "Amsterdam." It's about outfitting a bike with a coffee cup holder, not a water bottle cage. But what of us Midwesterners? How do bikes like this fit into our way of life? 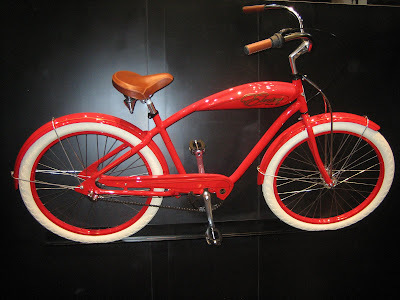 While at Interbike, I talked with a bike dealer from Indiana who carries Electra and has for a few years. He hadn't added a cruiser to his own bike collection until last summer, when he finally bought one for himself and put it in the garage next to his road, mountain, and fixie bikes. Nobody was more surprised than he was when the Electra became his "go-to" bike. "I was shocked that it became my favorite bike to ride around town, especially with my kids," he said. This was a sentiment echoed to me by Lawrence Kuh, a Bay Village middle school teacher with a lot of biking cred. (Lawrence is helping us organize the 2009 Bay Schools Bike To School Challenge, he is founder of the Bay Skate & Bike Park Foundation, and he was there at the beginning of Ray's MTB Park). He's another guy with a fleet of bikes in the garage who spent a LOT of time on a tandem cruiser last summer. I know exactly what they mean. I love my Raleigh Cadent, but my Electra Blanc et Noir is the bike I take to lunch with friends or volunteering at my son's school. 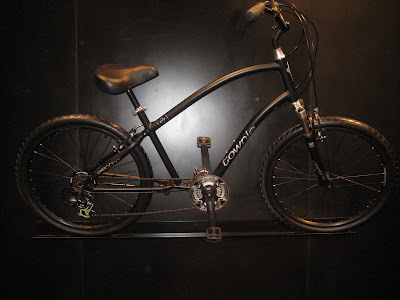 It's a blast to ride, a completely different riding experience that I rave about so much, my husband is now considering a cruiser of his own. Should you, too? 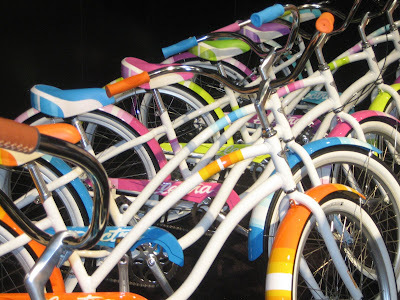 Speaking of bicycles for transportation I just received this from a newsletter out of Eugene, Oregon. Eugene has been a cycling community for many years. It great to see our area moving in a positive direction and to have a great crew like Century Cycles leading the way! You can affect the future of walking and biking in Eugene! You can do that by telling City staff and citizen members of the Pedestrian and Bicycle Master Plan Committee where walking and biking improvements are needed. Just attend one of the three open houses listed below and help the City make Eugene more walkable and bikeable. The three open houses will have stations with information on the existing pedestrian and bicycle system, planned improvements, and innovative walking and biking design treatments. Participants will be asked to identify existing problems and needed improvements to make Eugene more walkable and bikeable. The first phase of the pedestrian and bicycle masterplan will focus on five neighborhoods in the south hills area of Eugene: Laurel Hill Valley Citizens Association, Fairmount Neighbors, Southeast Neighbors, Crest Drive Citizens Association, and the Churchill Area Neighbors. City staff and members of the Masterplan Advisory Committee will be on hand to guide the public through the stations and collect public comments. Interested members of the public need to only attend one of the three scheduled meetings. Three separate meetings are scheduled at different locations in the south hills area for the convenience of the public. If you have any questions about the Pedestrian-Bicycle Masterplan meetings, please contact Lee Shoemaker, City of Eugene Bicycle and Pedestrian Coordinator: lee.shoemaker@ci.eugene.or.us or 541-682-5471 or visit the Masterplan website at www.eugene-or.gov/pwprojects. Join fellow cyclists and walkers on Friday, Nov 21 from 4 – 6 PM at the base of the DeFazio Bridge in Alton Baker Park for hot cider and delicious goodies while we celebrate active transportation on one of the most scenic paths in Eugene! Enter the drawing for door prizes! Get a free bike safety check and grab some information on safe cycling. Stop by on your commute home and say hello! !